Today I'm feeling so nostalgic; all memories of Manila waving in front of my eyes and I'm remembering the first time I tasted this dessert in 'The Peninsula, Manila'. Awww, that was awesome!! :) That night, after returning from the dinner party, my fingers were tapping the keyboard and searching for that recipe. Finally, I got that and after some experimentation and personalizing, I came up with this easy recipe of Panna Cotta. Mix gelatin with milk in a heavy bottomed vessel, and heat it on low flame till it gets completely dissolved. Keep stirring to avoid sticking at the bottom and burning. Mix cream with sugar and simmer; do not boil. Let it cool. To the sugary cream, add the gelatin milk ad mix well. Refrigerate in the freezer for 2-3 hours. The consistency should be jelly-like and not frozen. If it looks frozen, keep it out for some time. On the other hand, prepare the mango topping. Blend the topping ingredients and refrigerate the puree in the normal compartment for 2 hours. After 2 hours, take the jelly-like creamy Panna Cotta in a serving bowl and top it lavishly with the mango puree. To add an extra mile, you could embellish it with small mango cubes. In place of mango, you could also use any other fruit pulp/ puree. Also, you could use different berries, like strawberry or blueberry. Since it has jelly like consistency, so you can mould or cut it in desired shapes. Since it is made of milk and fresh cream, so it's definitely healthier than the 'Jellies' available in the market which contain artificial colors and flavors. Panna cotta looks super delicious. Love the bright yellow color. This is so cool and refreshing! I'd love to grab it right away! Wow panna cotta looks delicious .. it is new to me. My kids would love this. I love when food evokes memories :) This is a great n unique version of panna cotta ~ looks so so luscious n scrummy! You have a beautiful blog space and enjoyed ur authentic recipes. Glad to follow u to instantly relish them. Looks so good in yellow.. perfect !! 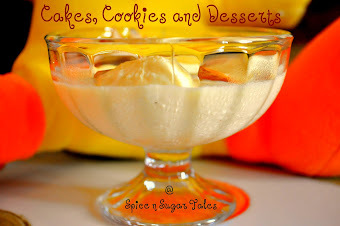 completely droolicious post, Anjali! LOVE IT!irresistible dear!